SAN JOSE, Costa Rica -- A male Pacific green sea turtle (Chelonia mydas) travelled 1587 km (986 mi) in 55 days, from Cocos Island, Costa Rica, where it was tagged last April 25, to Las Perlas, Panama, last June 19. The male turtle was christened Argo, after the luxury live-aboard dive-boat operated by the Undersea Hunter group ( www.underseahunter.com), which serves as the research platform for the long term shark and sea turtle tagging project directed jointly by researchers Randall Arauz of the non-profit Costa Rican organization (www.pretoma.org), and Todd Steiner of Turtle Island Restoration Network (www.seaturtles.org), based in San Francisco, California. Argo the turtle was equipped with a satellite transmitter (Wildlife Computers MK-10), attached by means of a tether to the trailing edge its top shell (carapace). Soon after tagging, Argo headed towards the coast of South America, entering the waters of Colombia before ending up in Archipi�lago Las Perlas, which consists of a group of about 39 islands and over 100 islets located in the Gulf of Panama, 48 km from the mainland. Sea turtles are known to nest on these islands. 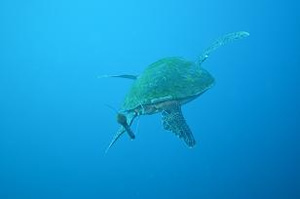 "Green turtles are commonly reported as bycatch during longline operations, which are heavily used in this region year round," warned Randall Arauz. "We are glad Argo made it all the way to Las Perlas as we suspect he is looking for female turtles to mate, and hope he continues to sort these barriers as he migrates through the Eastern Tropical Pacific." This research is helping to unravel the mysteries of the long migrations of sea turtles through the open ocean and into and out of the sovereign waters of many nations," said Todd Steiner, biologist and executive director of SeaTurtles.org. "International cooperation combined with the best available science will be a key factor into designing conservation and management strategies to save green turtles and other endangered sea turtles in the Eastern Tropical Pacific from the devastating impacts of industrial overfishing," added Steiner. Pretoma and Tirn jointly initiated a long term tagging and monitoring program of sea turtles in Cocos Island in March of 2009. A total of 85 green turtles, two hawksbills (Eretmochelys imbricata), and one olive ridley (Lepidochelys olivacea) have been caught and tagged with external flipper tags. 23 turtles have been tagged with acoustic transmitters and 15 with satellite transmitters. Volunteer divers often accompany the research expedition and serve as citizen scientist research assistants. For more information on joing a sea turtle and shark tagging expedition, visit www.SeaTurtles.org/Expeditions. Join a sea turtle and shark tagging expedition! Visit www.SeaTurtles.org/Expeditions to Cocos Island, Costa Rica. Your expenses may be tax-deductible!